August 14th was quite a jam-packed day. After our river walk, a brief encounter with Basho, and a trip to another world, we accidentally stumbled upon a festival which I had read about but hadn’t realised was on our route. 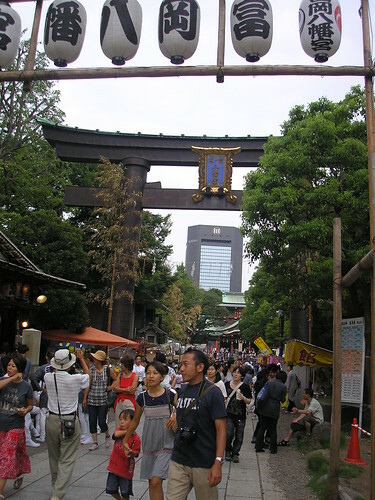 It was so perfect the way we just walked into the festival without planning to be there at all, and then I realised it was the exact same festival I had read about and quite wanted to go to: Fukagawa Hachiman Festival at Tomioka Hachimangu Shrine. After spotting these guys we knew there was a festival nearby, and we just followed them. I don’t know much about this festival, other than it’s one of Tokyo’s top three summer festivals, and it’s “the one where everyone throws water at each other”… Yes, the main highlight of this festival is seeing mikoshi (portable shrines) paraded through the streets and watching people throw water over the shrines and the people carrying them. We didn’t see much actual water throwing, but the people we saw were all soaked. I actually spoke to a fellow foreigner who had joined the festival. 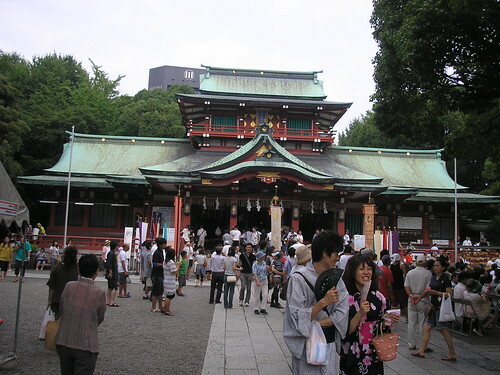 He said that it was a lot of fun but the shrines were really heavy. 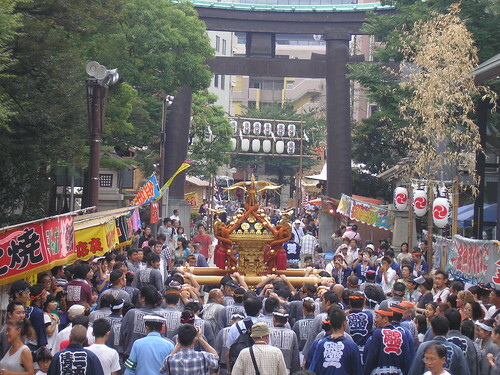 Above, you can see the mikoshi being paraded into the shrine. 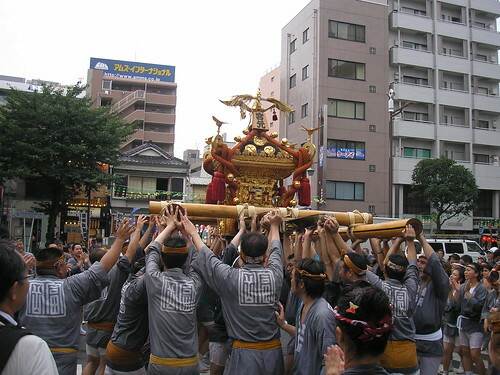 The mikoshi are carried by large groups of men (Can women carry them? I’m not sure…). 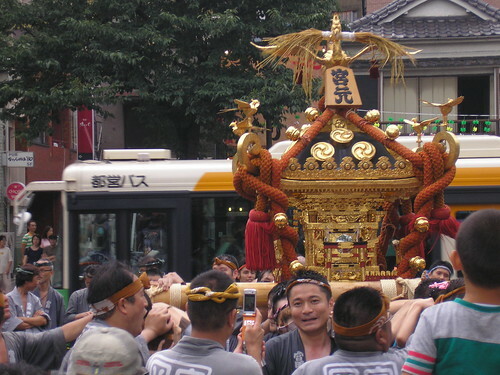 This guy, above, seems proud to have his photo taken with the mikoshi, but it must be hard to smile under that weight! They stopped here and turned the mikoshi around a full 360 degrees. Above, you can see the shrine itself (which was getting little attention with everything else that was going on around it). Alison, you are very lucky! Because this festival is held only once in 3 years. 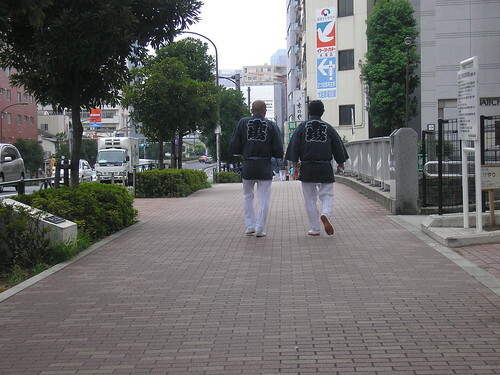 I used to live in this area, just 5 minutes walk from the Basho museum. Your articles & pics remind me of my good old days in Tokyo. Wow – I didn’t know it was only held once every three years! That’s lucky!! And you were lucky to live in that part of Tokyo – it’s a really nice area, I think.